So today I have to do a whole lot of Writing. 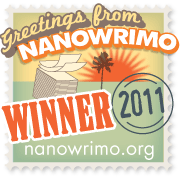 I asked someone on NaNoWriMo to be my writing buddy – they didn’t even reply to my NaNoMail…. I am sorry, Hart, but that is REALLY bad form, since I can see in my NaNoMail that you have received my note. At least have the frigging decency to reject me ‘face-to-face’.